✔︎ Clearly identify your pump model. the spare part list that fits it. 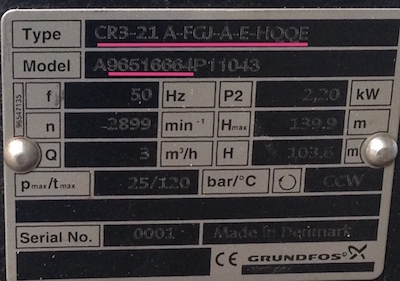 This information is to be found on the Grundfos pump nameplate. ✔︎ Specify which are the spare parts you need. In the service manual, select the exploded view where you can identify the position of each of the parts you are looking for. Write down the position number of all the needed spare parts. ✔︎ With these data, send us an email by clicking on this link. ✔︎ Send us a picture of the nameplate of your pump. ✔︎ If you do not have the pump type, model or pump article number, please send us as many details about your application as possible. We will do our best to help you find the Grundfos spare parts you are looking for. Grundfos pumps for industrial applications are developed by taking into account all aspects of their use, their energy efficiency as well as ease of maintenance. To ensure proper pump operation, it is important to regularly replace wear parts like seals, bearings, etc.